Are you currently searching for a party bus in Allen Park? If so, then you can stop what you are doing immediately as you have found what you are looking for. Here at Rockstarz Limousine and Party Bus, we specialize in providing our clients with an amazing time when on board our party bus, and we can assure you that your party will always go off with a bang. 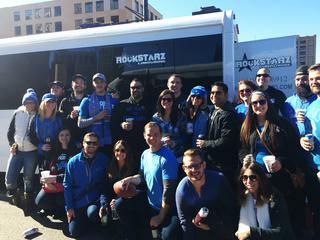 Our Allen Park party bus service is unlike anything else that you may have experienced. First, we have managed to get the maximum possible amount of space in our bus to allow you to invite even more people to come along and party with you, no matter the occasion. Also, we have added in some seriously comfortable leather seats to allow you to just rest your feet while the party goes on around you. Of course, no party is going to be complete without music, so we have also included a stunning stereo system that will blow your mind. Throw in a laser light show for some added atmosphere, and what you have is your very own club on wheels. Previously, people have used our Allen Park party bus rental service to celebrate a whole host of different special occasions. For us, the reason for the celebration isn’t important, but what is key is just make sure that everybody who is present enjoys their time with us. So, whether it be a birthday, anniversary, bachelor party, or you just want to get people together for a party, then our party bus is the place to be. Anybody that resides in the Allen Park area and who is searching for a party bus can give us a call here at Rockstarz Limousine and Party Bus. Alternatively, you can contact us by using the contact form on our website and someone from our team will be in touch.